Out of all the areas in the north west Portland to Seattle and even on up to Vancouver, British Columbia seem like a great corridor to run high speed rail (HSR). Obama has now pledged HSR for the country, on a massive scale. Obama’s plan, or support of the plan that has existed for years, is written up on The New York Times, US News, ABC, CNN, Wall Street Journal, and well pretty much every news outlet on the planet. I decided I’d take a look at the map and give my two cents on the various lines. This is an area where many train aficionados and I start to disagree. I am first and foremost pro-economically intelligent infrastructure. The economic viability is often more or just as important as how technologically capable and environmentally clean a resource is. High speed rail is definitely one of the top items in the list of options. It by far is superior to pretty much anything else available for distances of this sort. So let me lay into each section a bit. Since I live in the north west, I’ll tackle that first. south of Portland is an absolute 100% waste of money economically. The density and number of people is just not available yet. Maybe in 30-40 years there might be reasonable density, but right now it is a mere pipe dream. If one where to read what I wrote back in October of 2006, “Market Demand Cascades Service – ROUGH DRAFT” I point out how things could be achieved through private company means, or at least with MINIMAL Government tax and spend. I threw in a bunch of non-high speed corridor service too, which is what would be ideal for the Eugene to Portland stretch of the corridor. Between Portland, Seattle, and Vancouver (BC) high speed rail is almost ideal. Seattle definitely has the population, and Portland is most likely high enough to reasonable have high speed service between the cities. If we look at airline service between the cities there is the potential. However it would absolutely decimate air travel in that corridor. For this reason I’d be rather unhappy to see all those private sector jobs go away and be replaced with public sector jobs, which is what looks like would happen under the current plan. In California I’ve written on that in the past too, and it is absolutely worth the money. If you’re curious about how far this effort is along, go check out the Interactive Rail Map on the www.cahighspeedrail.ca.gov site. Now the Texas corridors are completely whacked. There needs to be a triangle, not the weird connections to Little Rock and such. That’s just absurdly stupid, there isn’t enough people to put in a few cars let alone a high speed train service. The same, unfortunately goes for New Orleans being connected to anything. If New Orleans did get connected, it needs to be connected directly to Atlanta, and that city absolutely should be connected with the north east, DC, etc. Florida on the other hand may be able to use HSR, but it is highly unlikely at this juncture. Maybe in 20-30 years in might be validated. The only place that seems to have the density is Miami. Tampa probably wouldn’t bode so well, Orlando is a sprawling catastrophe of a city, which would probably garner a very low ridership. Jacksonville and Miami however, if connected along the FEC corridor, would be ideal. Those cities are cities that would do business and actually have decent passenger counts if for any other reason because they could be connected to the north east, and the north east would provide a large passenger count. One of the other stretches I’m hard pressed to support is the stretch out to Kansas City. My response to that is simply, “you have got to be kidding”. Does KC even have a million people in the city yet? Maybe in the metropolitan area? St Louis absolutely, just because it would be reasonable and easily used service into and out of Chicago. To really summarize, it amounts to this. Expand the north east corridor down in North Carolina and into Georgia to connect Atlanta. Expand it another way straight down toward Jacksonville, Florida and on down to Miami. Forget all that snaking back and forth though. I wouldn’t even mess with trying to connect South Carolina’s capital. Create a regular slower speed service to the HSR service would be a better idea. Otherwise it isn’t worth the time cost for the meager ridership it would provide. Besides that northern and eastern stretches absolutely get Chicago connected to the surrounding cities. Cali & the north west, as mentioned, should be connected minus Eugene. Would high speed rail enable more sprawl further from cities? What would it do to the core of cities? Transit system in urban areas help keep a city compact and more human oriented instead of pavement and auto oriented. The key to keeping sprawl in check is to create real and honest town centers around these train stations that have real and viable urban transit. If they’re nothing but massive park and ride stops like airports are, we’ll have absolutely zero positive impact from high speed rail. If we don’t build intelligently around these centers, there is zero reason to build high speed rail and the money would be better spent increasing airport throughput and building new airports. That might sound sickening to some, or awesome to others, but it is the simple fact. The high speed rail lines can NOT be park and ride type stations. nding cities (that may be 100s of miles away) could be horrifying detrimental. If this system starts to be built, we shall see I suppose. Another thing that is not mentioned in very many of the write ups is the fact that this isn’t going to be built with the $8,000,000,000 or $13,000,000,000 dollars that has been made available. The real cost of a network like what is shown is probably a lot closer to $1,000,000,000,000 (That’s 1 trillion btw). The original rail system of over 225k miles was built primarily by the private industry and privately funded, cost over $12,000,000,000 in today’s dollars and did NOT have the inefficiencies or lackluster investment of public dollars. A few of the transcontinental lines got some tax dollars, but even that was of negligible help in the grand scheme of things. There is a historically relevant item to measure here, what we got for private money is absolutely different than what we get for public money. The public money buys less, provides lower service, and will probably become a boondoggle as the motive interests of people working under the public funding regime are absolutely not motivated as private funding regimes. Operations of course become and entirely new topic, but of similar issue to this cost concern. Amtrak if run under the same funding, staffing, and employee efficiencies of Virgin Rail (yeah, I’m using them as an example again) would be profitable (yeah profitable) to the tune of $50-300 Million per year! That’s more than enough money to start paying on the needed repairs that the passenger system needs, and to start purchasing equipment for increased and more frequent service. Instead though, it maintains a public funding stance and is by all means, a very poor service by any measure against buses or airlines in this country. Both of the later receive vastly lower subsidies than Amtrak. I think it is a grand and good idea. I however think there are major and very possible barriers to this getting built. There has to be more private interest and more prospective private funding and investments by are cities and people. I’ll put it simply, without a drastic increase in private input by citizens and especially companies for financing and operations this is truly a non-starter. Looking at the 30+ years of Amtrak operations and such lead me to see that high speed rail without these things would be the most expensive and costly form of transportation America has ever alighted upon. As I’ve said, America NEEDS and should WANT high speed rail, but we should do it in a truly American way and make sure that it is funded, operated, and properly implemented to meet actual and necessary market demand. Otherwise, it is mere fool’s folly to even dream of such a thing. So far though, Obama seems to be no fool, and is prepared to encourage and push for this private involvement that I make mention of. In that vein, hats of Mr. President, and keep up the good work. Next Post → How Do We Get MAX LRVs Now? I completely agree with you that for this to work private companies will need to get into the game. Private companies should run passenger rail so that there would be more competition, and in turn, increase customer service, usability, and technology. Unfortunately, I think the government has to reengage and try to put the umph back into rail first before private companies will invest. It’s sad that we let the infrastructure go in the first place. We got greedy with our own individual gas guzzlers and thought the highway system was the end all be all. We started tearing up the tracks to replace them with trails thinking we’d never need them again. When in fact, riding the rails is an eco-friendly, family friendly way to see the country and travel to the destination of choice. Now, the US is far behind Japan and France when it comes to HSR. On the particular routes, being an Oklahoma native I think that a HSR betweeh OK and TX would actually be a huge benefit to both states and used by the citizens frequently. There is a ton of "traffic" between OK and Dallas. I’m not sure about the Little Rock route, I’d like to know what data point they are using to determine that one. But maybe there’s heavy "traffic" from Dallas to Little Rock for some reason. Of course, the Pac NW would be my pririoty because that’s where I live! 🙂 But no matter what the route or no matter what the above map looks like I’m just thrilled that we now have a President that thinks it’s important to invest in the passenger rail system! "Unfortunately, I think the government has to reengage and try to put the umph back into rail first before private companies will invest." Ditto. That is the key, as you put it, "unfortunately". But once investment is made again their will be increased and renewed interest. I am not too familiar with the Pacific Northwest corridor, but is ridership really that pitiful south of Portland? Seattle and Portland are the largest cities in Washington and Oregon, respectively, though Portland does not necessarily have to be Oregon’s terminal city for the line to succeed. The linear cities along Oregon stretch to Salem (state capital), Corvallis and Eugene (both with state universities). State capitals usually have large numbers of government workers, as well as interaction with legislators and regulatory bodies. University cities are destinations because of the large number of college students and workers (faculty and support staff), sporting events, as well as being economic incubators (most likely, the Duck and Beaver alumni will be putting their degrees to use in Portland or possibly Seattle). Yeah, south of Portland the ridership is almost non-existent. As Erik H has pointed out in comments before, it is actually less economically and environmentally friendly to allow the 30-70 people to ride on the train vs. just running bus service. Now keep in mind though, the train service south of Portland is very slow, takes longer than the bus most of the time, and Amtrak does run about 2-3 frequencies a day (along with 2-3 more Greyhounds frequencies) each day. If these passengers could get their faster on the train the service ridership would improve drastically. For right now though, it’s horrid. As for high speed rail I see no way that they would attain the ridership to validate the outlay from Eugene to Portland. Maybe in 20-25 years they could throw together a plan. As long as the ROW is maintained between the cities we could always be prepared, but train service… just not really a good idea between here and there right now and for the foreseeable future. There are six Greyhound departures southbound and five northbound. There are two Amtrak Cascades trains, the Coast Starlight, and three Thruway bus roundtrips, plus a Friday and Sunday only southbound. There are three Horizon Air round-trips (two on Saturdays). There are four SkyWest round-trips. The lowest traffic volume on I-5 is 38,000 ADT, at MP 209 between Albany and Eugene. There are four Amtrak Cascades round-trips, and NO Thruway buses. There are four Greyhound round-trips. There are 25 Horizon Air round-trips, however some do not operate on Sundays and/or Saturdays. There are six SkyWest round-trips. The lowest traffic count on I-5 is 40,000 at SR 4 in Kelso, and 42,000 at several points between Kelso and Chehalis. The higher number of air trips between Portland and Seattle clearly show more white-collar business travel north of Portland than south, this is the kind of traffic airlines like as it is often full-fare, high value, repeat business. The lower number of Greyhound trips north of Portland is likely a direct result of competition with Amtrak. Greyhound’s traffic is basically the "bottom of the barrel", very low yield. Similar to the traffic on Southwest Airlines as compared with the "legacies". I would like to know how HSR supporters are using arguments more for commuter rail to build support for HSR. HSR is **NOT** going to help congestion – it doesn’t serve the same markets where congestion exists. It is **NOT** going to help pollution — not unless you can obliterate air travel in the same market. Note that where HSR operates today – Japan, Germany, France…are frequently burdened with air pollution concerns which have not been remedied by high speed rail. Albany doesn’t have an air pollution or a freeway congestion problem. Kansas City is actually pretty comparable to Portland population wise for the entire metro area. Not so sure about its density though. Just to note, even 110mph rail service has decimated air shuttle service in areas of the country that it is available. The NEC handles about 50% of the traffic in that area. HSR provides REAL alternative to air travel, and if it was honestly HSR in the NEC would probably have vastly more share of the market than air travel. The train actually goes where people are trying to go in the NEC, the airports are rather far away. Travel between Portland and Seattle could easily decimate air travel with true HSR. At half the price ($90 bucks) of the current business airfare (which often is about $180 bucks) HSR could decimate air travel in this corridor AND turn a profit. Toss in a light rail line that connects to Redmond, Boeing, or any of the other employment centers and you’d have zero reason for air travel in the corridor between Portland and Seattle. If we could achieve a measly 110mph that could also easily decimate a significant number of air travelers. Even a mere 90mph of on time service in the 95% range would attract thousands of new travelers per year. Which in turn, would make rail travel profitable between Seattle and Portland. If the trip was maintained at 79mph, but the cut out loiter times and such to a reasonable level, and made the trains run on time in the 95% range they’d still be able to grab at least 10-15% of those air travelers. Many people WANT to take the train between PDX & Seattle but can’t because of the scheduling issues. Usually ranging in the 20% late trains, all of which are about 30 minutes or more late. This is unacceptable for business travel. So this is really simple. 1. Get the trains off of the Eugene to Portland route for now. 2. Get the trains running on time between Portland and Seattle, and Seattle and Vancouver. 3. Add service frequencies, at minimum, 3-4. That would take the place of about 8-10 of those air shuttles (many only carry about 20-40ppl per flight). 4. Increase the speed to 90mph. 6. Start segmenting passenger from freight, upgrade to 110mph where feasible. 7. Increase train frequency by about 4-6 more trains. Gain that 30-40% of the air share. 8. Start buying actual new equipment that can be used for true HSR. 9. Start upgrading to real HSR. Nab that remaining air shuttle passenger traffic. 10. Attain a reasonable 60 minute or so trip between Portland and Seattle, and about the same between Seattle and Vancouver. (Maybe 70-75 minutes). Eric, the biggest problem with high-speed rail that could only justify itself as attractive for business travel is a civic bauble. High-speed rail does what for the rest of the world … ? 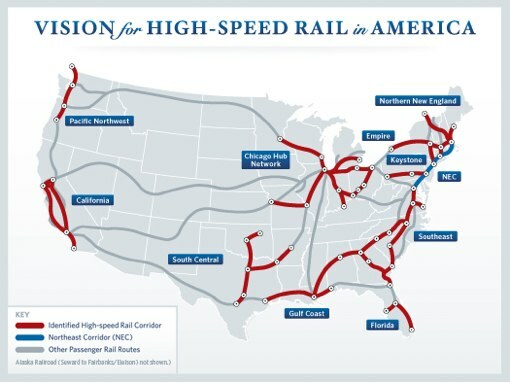 High-speed rail must be what the interstate highways were in the 20th century. The trains must capture as wide a net as possible. Trains must be able to take the same burden as the roads do today. One big part of it is, yes, commuter traffic. The key difference is that commuter rail tends to have station stops of 1-3 miles spacing. High-speed rail should have at least a minimum of 10 miles spacing between stations — ideally 25. You should have a stop for Sea-Tac Airport, Tacoma (Fort Lewis), Olympia (state capitol), but these have obvious rider magnet destinations. Fort Lewis is one of the Army’s biggest bases, and both uniformed military and civilians would rely heavily on the trains. In Southern California, one of the busiest trip-generating stations is Oceanside, Ca. Yes, it is along the beach and is a major commuter rail, transit and Greyhound center … but a huge portion of its ridership is supplied by Camp Pendleton. As I’ve said, even sleepy state capitals produce thousands of government workers. Plus, business-class travelers would have to interact with capitals for lobbying or regulatory business. High-speed rail, though, would serve the hearts of these cities because they each have a major draw. Also, keep in mind that you might not get much of a high-speed effect anyway between Seattle and Tacoma because the area is so built up. High-speed trains would not make all the stops Erik mentioned. BTW, if speeds are competitive enough to make inter-metropolitan travel within commuting time (no more than 2 hours one way), it will be bound to happen. You know what one of the best reasons California has for building high-speed rail? It would connect the prosperity of the Bay Area and Southern California to the Central Valley (in some studies, poorer than Appalachia!). Yes, it would be an environmental nightmare to make Fresno and other mainly agricultural counties into the coasts’ bedroom communities. In other words, sprawl on steroids. Well, agriculture is sucking California’s water dry and it is a highly toxic enterprise. Also, the Central Valley has the hallmarks of economic backwardness that it can’t do much about. There are four state universities between Los Angeles and Sacramento (not counting ones in those metro areas). Unless the students are majoring in agribusiness, they’ll get bachelor’s degrees but no place to put them to good use locally, apart from public-sector employment. If they want to stay in California, they must then move from the lower-cost Central Valley to the astronomical coastal areas. High-value, private sector employment (which the Central Valley craves bad) avoids the Central Valley because it’s not location-competitive. You’re really stuck with north-south traffic. The coastal ports are hard to access and congested, and multidirectional travel is only available in the Bay Area, Sacramento and the Los Angeles metro area. High-speed rail can be a game-changer. Enterprises that cannot afford to expand in the populous coastal metropoles can filter down lower-value functions to the Central Valley, where wages would rise and those college degrees would be put to good use. High-speed train service will allow these Central Valley functions to be tied to the coastal nerve centers easily and effectively. This is the best case that could be made for high-speed rail. This is also why other corridors should consider the filtering effect of high-speed rail. Just to let you know that there is a Canadian national citizen’s advocacy group that has been established to help educate people about the benefits of high speed rail. We do this through our website <a href="http://highspeedrail.ca">http://highspeedrail.ca</a&gt; and through our public symposiums. Please check out our website. Wad: "High-speed rail does what for the rest of the world … ?" Well, considering that there aren’t exactly a huge number of high speed rail systems in the world…there’s the TGV, the ICE, and the Shinkansen for the ultra-fast, and then there’s a few other trains that are in the ballpark as the Acela Express that are faster than 79 MPH but slower than 150 MPH. "You should have a stop for Sea-Tac Airport, Tacoma (Fort Lewis), Olympia (state capitol), but these have obvious rider magnet destinations." OK, but upgrading the existing route (which is the proposal) won’t accomplish ANY of those. The line passes well east of Sea-Tac. The line serves Tacoma but getting out of Tacoma west is a challenge. Currently one must essentially make a huge U-Turn, travel back north along the Foss Waterway to get back to Puget Sound, go under Point Defiance, and then back south…a time consuming, tedious process. The alternative is to build the new "straight-shot" route which requires a steep climb and some pretty tight curves to climb out of downtown Tacoma. Olympia is the picture perfect example of sprawl. Less than a decade ago, the Olympia station – which is actually in Lacey’s city limits – was in the middle of farmland. Today? SPRAWL! Sprawling, non-friendly auto dominated residential neighborhoods of McMansions surround "Centennial" Station. Another point that is mentioned is that government workers and the military would benefit from HSR. Not so fast — HSR fares are typically very premium fares and as a result are targeted for business class travellers. Do Army Privates get to travel business class on commercial airlines? They’re lucky to travel commercial – they more than likely are going to take a shuttle bus over to McChord to board a C-135 transport for official travel. Oceanside might be popular for Camp Pendleton because Amtrak’s Surfliner trains are not "business class" travel…they are little different than Greyhound. So they are affordable for the Marine Private who has a day off and can take a day trip to Los Angeles. Again – anyone on official travel probably isn’t on Amtrak, they’re flying a military passenger flight or transport flight. "Well, agriculture is sucking California’s water dry and it is a highly toxic enterprise." So High Speed Rail and development and sprawl is a better option????????????? "Enterprises that cannot afford to expand in the populous coastal metropoles can filter down lower-value functions to the Central Valley, where wages would rise and those college degrees would be put to good use." "Another point that is mentioned is that government workers and the military would benefit from HSR. Not so fast — HSR fares are typically very premium fares and as a result are targeted for business class travellers." The biggest expense of high-speed rail is capital. Once this capital has been sunk — remember, undertaking infrastructure capital is a point of no return since the costs cannot be recovered in case there’s buyer’s remorse — we design a system that only works for a class of people who already have too many transportation choices, and then proceed to make the system useless for anyone but them. High-speed rail will succeed if and only if business travelers adopt it? Well then, forget about it. I disagree with the proposition that transportation planners need to chase advertising demographics for rider use-case scenarios. If we are to have a stake in high-speed rail, it needs to meet as many use-case scenarios as possible. Erik: "Oceanside might be popular for Camp Pendleton because Amtrak’s Surfliner trains are not "business class" travel…they are little different than Greyhound." Paradoxically, Amtrak is the more popular service even though on paper it is inferior to bus service. Greyhound and its Mexican subsidiary run more trips along the parallel I-5, for a lower price, AND nonstop trips to Los Angeles and San Diego. Yet despite this, the Surfliner does brisk business from Oceanside, even though riders pay more for a slower service. The Surfliner has a "business class" car, though I don’t know what the premium fare includes. Yet the basic amenities are nothing to dismiss, either. Every seat has a tray table, a power outlet, legroom 1.5 times that of a plane, and an on-board snack service. Eric: "So High Speed Rail and development and sprawl is a better option?" Remember, California has two megalopoles of more than 10 million people, and another 5 million-7 million scattered outside of these areas and the Central Valley. All of these people fight over the 20 percent of water that does not go to agriculture. Yet getting the bottom end of the water pitcher does not prevent the urban areas from being economically prodigious. "A supply region is a source of resources. We think of resources as riches, but it’d be truer to say that when the gods wish to curse a region, they make it rich in resources. … A city region is used to change, is constantly innovating; a supply region is not. It treats its resources as God’s gift, a presumably eternal windfall; it prepares only half-heartedly for the end of the boom, and when it comes it’s caught short." *-Modesto is the largest city and county seat, but the university is located far outside city limits in Turlock (pop. 68,133). So we already have well over 2 million inhabitants in the four more populated counties of the Central Valley. So forget about containing sprawl, it had already rolled along Highway 99. To what degree will the Central Valley sprawl once you bring high-speed trains through? No one will say for sure. But, at least for a generation after the train arrives, you’ll see an urban/rural tension with "sprawl" confined to the well-defined city limits. As prices appreciate, then maybe you’ll begin to see development in the hinterlands. However, it is more likely the pro-sprawl Central Valley would endorse a Portland-style urban growth boundary! Erik: "I’d rather have agriculture and cheap food than sprawl, thank you very much. (Because sprawl without food is self-destruction – how does one live without food?" That’s a very good question. L.A. doesn’t talk much about the Great Famine after leaders in the city and suburbs decided to pave over our agricultural bounty. (And please don’t give me nonsense that Southern California was/is a desert.) Why is that? Perhaps because … it never happened! L.A. found a way to feed itself long after we pushed agriculture out of the city, then the county. To answer your question, though: We trade. Erik: "That doesn’t make sense to me…the central valley has been, and is, prime agricultural land. Why would developing this region with non-productive "workers" be a boon? These people could just as well be accommodated in Los Angeles or the Bay Area without high speed rail…"
You’ve just answered some of your own questions. The only ones benefiting from California’s prime agricultural land are the agribusinesses. Agriculture has an important place for both humans and the economy, but its presence has pernicious effects. Agriculture stultifies commerce. Especially California agriculture. We don’t have the friendly farmer wearing overalls and talking in a Midwestern drawl. We have agribusinesses. They tend to headquarter near the agricultural bureaus, not their land. Plus, they operate on such a large scale that much of their operations are heavily mechanized. The part that requires human hands is filled by itinerant migrants from Mexico, Central America or Southeast Asia. So, as for jobs, our agricultural sector is more of an economic boon to the Third World than it is to its own backyard. Most of the farmworkers’ wages are remitted back to their home countries. Some of the farmworkers who stay in California eventually set up small-plot farms and fill in niche markets such as farmers markets and urban coops. Want to know about some other side effects of California agriculture? Well, besides the water, it’s very dirty and hazardous to health. Central Valley, not L.A., has the state’s worst smog despite the latter’s car usage. The chemicals also leach into groundwater. Plus, the medical problems tax the health systems in an area described by some studies as poorer than Appalachia, so you have people that can’t afford the specialized care needed and regions that struggle to import the people and materials to make the care possible. That’s the human toll. Here’s another economic toll. What you are calling HSR-enabled "sprawl" is actually a sound economic development strategy. This baby should be thrown out with the McMansion bath water? That is just downright sadistic. I showed you four counties, with a population north of 2 million, that have universities. These counties run expensive higher education systems, all for the sole purpose of exporting college students because there is nothing for them to do locally. Those that do stay find the only place where job prospects match education and capabilities is in the public sector. So the people who stay put pressure on local, state and federal (Fresno’s largest employer is an IRS tax processing center) governments to create more public-sector jobs. And that’s a happier outcome. The outlying counties try to build economies around prisons. So, high-speed rail has the best potential of solving several economic development issues in California. Think of it as a $40 billion investment in comparative advantage. Adron’s an economics buff — he could explain it in more detail. Basically, here’s the problem. The Bay Area and Southern California generate a lot of productive wealth. It’s a splendid problem to have, but even more wealth than we know what to do with has disastrous consequences. The other side of a high-value economy is very high costs. This imposes a strain on both businesses and labor. If left unchecked for too long, the high costs will eventually collapse on the high-value sector. The Central Valley, on the other hand, has absolutely nothing it can offer to the rest of the state. Agriculture? Remember the warning of the resource curse. The physical product comes from the Central Valley. The value is added elsewhere. The land-based goods distribution is in and around Sacramento and Bakersfield. The ports for international trade are in Oakland, Long Beach and San Pedro. The processing is typically done on the exurbs between metropolitan areas. The commodity prices that determine raw value are set in New York City or the Midwest. The coasts realize they need something from the Central Valley after all. Business leaders take a tour of the train, and economic development officials from Central Valley cities and counties begin to tout their universities and cheap land. Aha! Certain business leaders will determine that they must stay in California because it is an important market to serve, their businesses are location-dependent, or because California offers intangibles (culture, great weather, natural scenery) that cannot be replicated elsewhere. The last category is important to consider, because people don’t think like spreadsheets. When Nissan moved its Southern California headquarters to Tennessee, only about half of its employees chose to move even though every worker who wanted to continue had a job waiting for them. It would be relevant for local officials to see the reasons why half chose to leave, just as Tennessee might want to see why it could not attract the other half of Nissan’s work force. Anyway, business leaders can see that they can shift some functions to the Central Valley and still maintain a presence in California. They can keep the high-value services that justify a premium price in the more expensive coasts, while it can gain competitive advantage by shifting other functions to a city somewhere on the rail line without completely displacing its existing work force. The reasons why this can’t be done now is because the existing infrastructure cannot support such a plan. The highways are too indirect and most of the day would be spent driving. Flight service is already a pain and it’s too short of a distance to be cost-efficient. At around 500 miles planes gain efficiency while trains lose theirs. Sadly, our Prime Minister is backwards, and does not support HSR of any kind. He is a leftover for the Bush/Gordon type of Conservatives. Is this a custom theme by chance? Hrmm that was weird, my comment got eaten. Anyway I wanted to say that it’s nice to know that someone else also mentioned this as I had trouble finding the same info elsewhere. This was the first place that told me the answer. Thanks. Sorry bout’ that Steven. I’ve had the "must authorize" comments turned on because of all the idiot spammers. Glad I could provide some answers for ya. I try to keep things informative. This is new info for me thanks. Cool, nice template. Where did you get this from? Very interesting post – Might be old new, but it was new to me. Thanks. I think your blog has a very cool wordpress template. I allways snoop arround to find cool wordpress templates, The site has nice and unique wordpress templates.